This detached cottage is resting just outside the town of Ballybofey, in County Donegal. Hosting two double bedrooms and one family shower room, this property can sleep up to four people. Inside, you will also find a well equipped kitchen, along with an open plan sitting and dining area hosting a wood burning stove. To the outside, is off road parking for three cars, and a gravelled garden to the front, with a patio, furniture, and a barbecue. 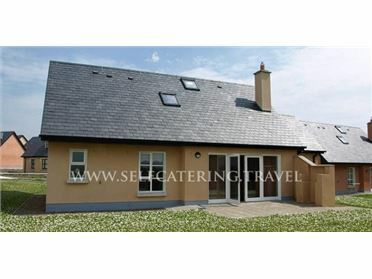 Located in a rural setting, and close to the town centre, Curraghamone is a lovely accommodation in a heart-warming part of Ireland. Oil central heating with woodburning stove. Electric oven and electric hob, microwave, fridge/freezer, washing machine, TV with Freeview, WiFi, DVD, Radio/iPod dock. Fuel, power and starter pack for stove inc. in rent. Bed linen and towels inc. in rent. Travel cot and high Chair available on request. Lockable bike storage. Ample off road parking. Gravelled garden to the front with a patio, furniture and BBQ. Sorry, no pets and no smoking. Shop and pub 2.8 miles. Note: Phone signal is very limited due to location..